It’s always really tempting to have a really nice big fried brekkie at the weekend. Having that extra time to prepare and eat something more substantial instead of shovelling a bowl of blueberry wheats hurriedly down your throat as you’re walking out of the door is a real luxury so why shouldn’t you treat yourself to a nice bacon sarnie or a big fry up? Absolutely no reason at all really, as long as you’re not eating said fry up every day of the week. That is unless like me you’re trying to lose weight and currently eating super heathy and exercising lots. Yoghurt and fruit and (non sugary) cereals are perfectly good breakfast foods if you’re on a diet, but when you’re about to do an hour and a half’s morning aerobics early on a Saturday you sort of feel like you need to have put something a bit more substantial inside you to get you through. 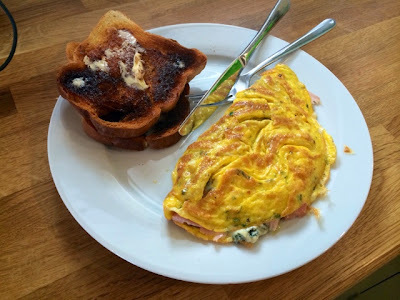 I find omelettes make great breakfasts to fill you up without being too unhealthy, you get a nice cooked breakfast whilst managing to sidestep all that grease and fat. 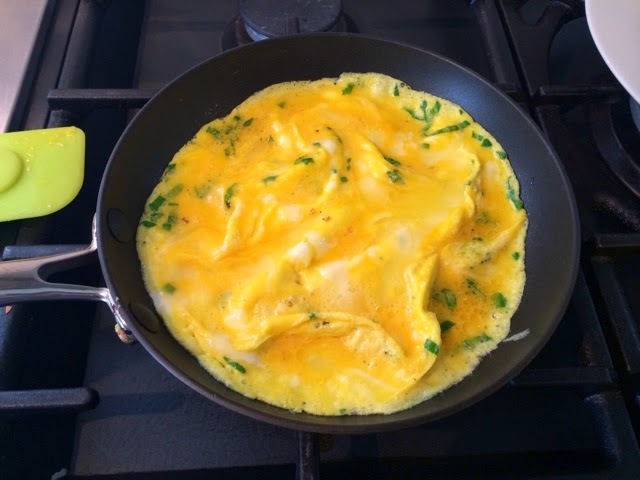 Eggs are a great source of protein which is important for exercising and you can mix and match your fillings to really vary the flavour. I was vaguely cheating with this breakfast allowing myself two slices of toast on the side, but if you’re being mega strict and trying to cut out the carbs completely then toast is entirely optional. 1. In a pyrex jug beat together 3 eggs, add the basil and season well with salt and pepper. 2. Heat a little oil in a frying pan on a medium-high heat. Pour in the eggs and tilt the pan to evenly cover the pan. Gently cook for around 3-5 mins or until the eggs are almost cooked through. 3. 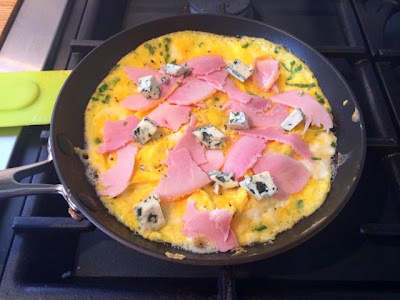 Evenly scatter the ham and blue cheese across the omelette and cook for a further 1-2 mins allowing the cheese to begin to melt. 4. 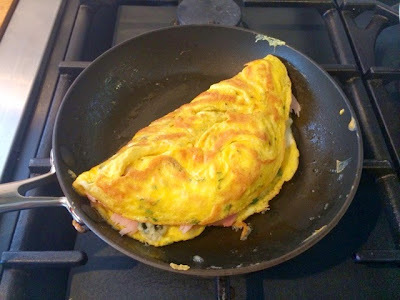 Fold the omelette in half and press down gently and cook for two more minutes. 5. 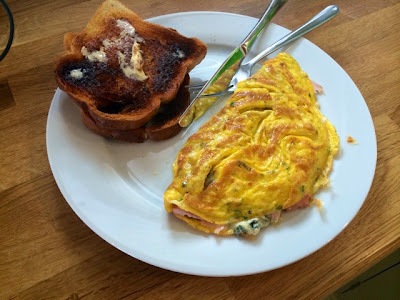 Dish up with some toast for a nice hearty breakfast.